Already at the founding of the Swedish East India Company in 1731, the company seems to had taken under hand most of the Swedish export trade to Spain with all kinds of ship's material such as wood, iron, tar, rope and riggings, dearly needed by the Spanish fleet. In 1739 however, a war broke out between Spain and England, which seems to have put a stop to this direct trade. If the Swedes would have been caught red handed shipping ships furnishing to Spain, the British would by all means felt that the Swedes had sided with Spain. Something that would have put the Swedish East India fleet at risk being captured as war spoils. This was also more than a threat. As a matter of fact the Gotheborg had during its previous outgoing voyage been held up by the British and questioned specifically about this. Probably with this in mind the outgoing cargo of the Gotheborg was in 1743 very small or none at all. The silver that was to be picked up in Cadiz, must thus been financed against documents and paid for with other means or lent out from international bankers with part of the future profit, as collateral. This is the cargo list, of what was taken on board in Canton, its weight and values. When reading this, a 'catty' could be quickly translated as equal to 1 lb or 0.5 kg..
289 chests, 12 tubs and 2388 bundles of porcelain. All in all a total of 650-700 tons of return merchandise was brought on-board. Further 80 tons of water and 110 tons of provisions was added to the cargo giving us a total cargo of 840-890 tons, matching the estimated cargo capacity of the ship. Regarding the 'Tutanague', after the divers found a number of these bars, they could for the first time be weighted, measured and analyzed. This showed that the Tutanague bars were 99 percent pure zinc, and that their weight was each 21.6 kg. The bill of lading mentioned that there had once been 6056 pieces on board with a total weight of 220,041 cattys, which in that case would have been 130809.6 kg (or c. 130 tons). We could now compare reality with the weight given by the bill of lading in Canton. Since one catty is, based on 1/100 Pekul or about 0.5968 kg, this would give us a total of 131320.5 kg. All in all, this shows a negative difference of 514 kg. Maybe the missing 500 kg could have just eroded away from the 130 tons in the salt water after the foundering? Otherwise there seems like someone has helped themselves to around 25 bars of Tutanegue. If instead the catty would be defined as equal to about 4/3 pound avoirdupois (604.79 grams) the original cargo should have been 133078 kg and the loss, 2269 kg or almost exactly 100 bars. 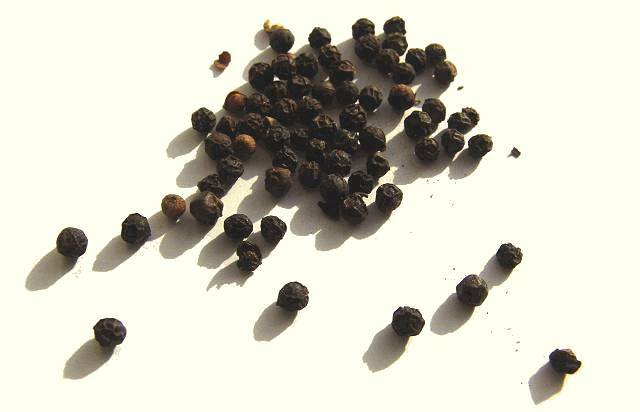 Black pepper (modern). Photo: Jan-Erik Nilsson, 2005. The bill of lading mentions 3001 catties of pepper. At 0.5968 kg per catty this equals 1,791 kg or around 1,8 tons. A normal modern kitchen jar of black pepper today contains 42 grams of which we would get around 20 out of a kg. Out of the total cargo we would thus get 35,820 modern household cans. Considering that meat during this time could be really awful and needed some serious seasoning, this does not sound much. The price for the pepper cargo was 11.5 Taels per Pekul (or 0.115 Teal per catty) giving us a total of 345 Teals, 466 Pieces of Eight or 1,553 Dal Smt. Dried Galangal Root, bought at the spice market i Istanbul in 2013. 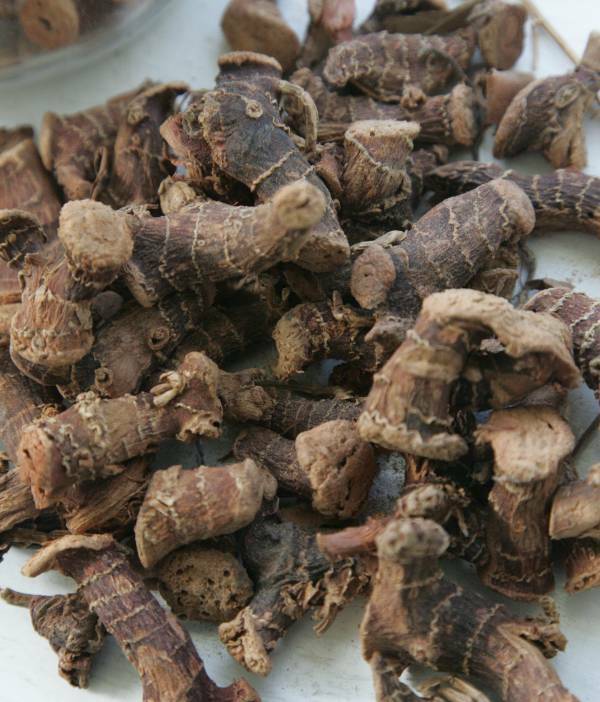 Galangal is a rhizome — actually, a family of roots related to ginger. There are two main varieties: greater and lesser. Greater galangal, known as laos, is native to Java and popular in Indonesian and Malaysian cooking, as well as in parts of India; it's gingery and mildly pungent. Lesser, known as kencur, is native to parts of China (though it's not used in the cooking there), India, and the rest of Southeast Asia. Of the two, the 'lesser' is more spicy and peppery. Fresh or dried galangal tastes like a less-pungent version of powdered ginger. Fresh gallingal looks like a crossbreed between an asparagus and a radish. Dried, looks like a, root. In South East Asia today alternative names on the same thing is also lengkuas, galangal and blue ginger. Its purpose in the cargo has been questioned since it is really not much of a spice. As for storage, it appears to just have been filled in the space in-between the tea chests. It has been speculated that the purpose of this inexpensive spice was to protect the tea from absorbing all kinds of other alternative smells from bilge water and whatnot. 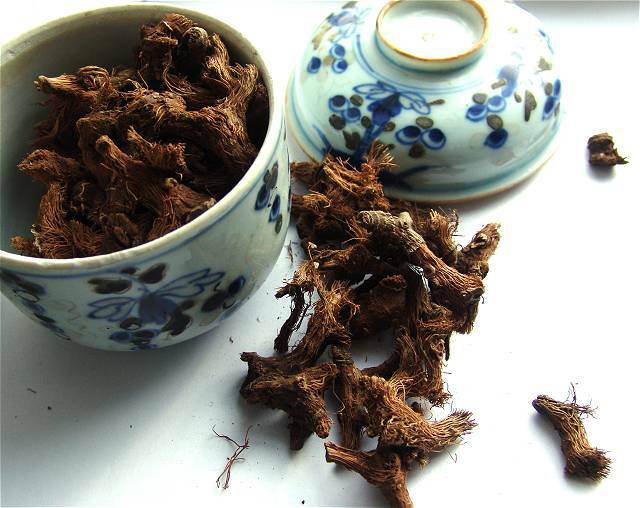 Even if the Gallingal did have a market as a medical plant and has been mentioned as flavoring agent for homemade alcohol, the protection of the tea might very well have been enough to motivate its purchase. Tea even today is well known to be a cargo very sensitive to foul smells. The Gotheborg cargo list mentions 18,837 catty's of Gallingall at 1.6 mas per Pecul. At the exchange rate at the time of the departure August Tabuteau thus seems to have bought 11.241 tons of Gallingal at 301 Teals, 407 Pieces of Eight or 1,356 Daler Smt. Rattans in the cargo list is pretty straightforward. This is probably branches of the palm Calamus rotang, "somewhere between a palm and a grass" as Liljewalch 1848 (p.207) put it. It didn't weight much and was a reasonable commercial product with a ready market in Europe. The Dutch as well as the Portuguese had probably brought it to Europe from the earliest times of shipping. Its use was for making baskets and seats for furniture, for tobacco pipes, for boning in corsets, and for making walking sticks. It was usually sold in bundles. The Gotheborg cargo list mentions 3,748 catty's (1 catty=0.5968 kg) of Rattans at different prices, at a total of 109.272 Taels. At the exchange rate at the time of the departure August Tabuteau thus seems to have bought 2.24 ton rattans at the price FOB of 147 Pieces of Eight or 492 Daler Smt. Tea from the excavation area of the Gotheborg. Mixed in with the tea leafs is a small stick of Rattan from the 2.24 tons that were on board. Photo: Jan-Erik Nilsson, 2005. A black tea that was the cheapest to trade in. It was originally the choicest grade but later an inferior variety. The name comes from the Fujian pronunciation of the Chinese (Mandarin) Wuyi (shan) mountain range on the border of Jiangxi and Fujian provinces. It was harvested early in the summer and varied in quality. Small, fine leaves were the best, rough and wide leaves were the worst. If the tea was full of dust, it was from the previous year's harvest. Over 80% of the tea that the East India Company imported were usually Bohé. This was the 2nd most common sort, also a black tea from the Fujian province and known as a better sort of Bohé. The difference was hard to decide for the buyers, except as they said, from the higher price. It was harvested in May and the leaves were small and fine. 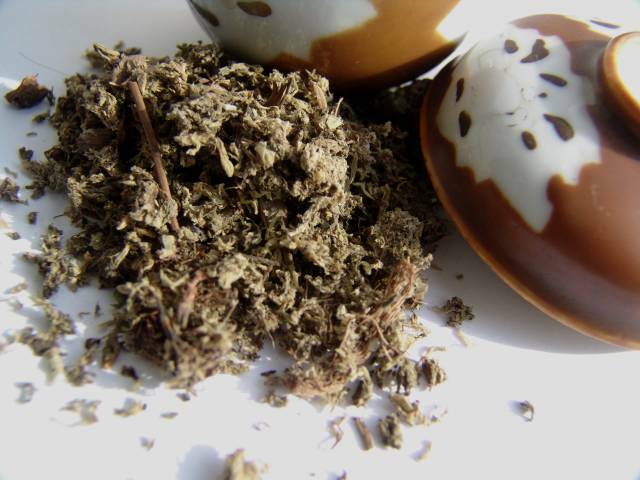 Other sources have it that it was obtained from the fifth and largest leaf, gathered from a shoot tip of a tea plant. The colour of the tea should be 'more yellowish'. The name might be from the Amoy word "kong hu" referring to "elaborately prepared", corresponding to Chinese (Mandarin) gongfu (chá), from gongfu, workmanship. In the original documents we find that the Supracargoes had it that this was also a black tea from Fujian, better than Congou and almost three times more expensive than Bohé. It was harvested earlier than May and was recognized on a light colour a pleasant smell and of that, the leaves in the pot should be green. From more recent information we find that Souchoun is Cantonese (siu-chung), and equivalent to Chinese (Mandarin) seou, small + chong, plant/sort/kind, and could be any of several varieties of black tea native to China and adjacent regions. This was called the Imperial tea, a green tea with broad leaves from the Anhui province and it was the only green tea that the company bought. Bing was from the first harvest and was picked end of February and early March. The fresh leaves were sticky and were collected only for the emperor and the very wealthy. On average, around 2,5 tonnes were imported per ship. Onboard the Gotheborg, only 10 small chest, 345 kilos. If this was actually Bing at all was actually hard to tell since the price was lower than for the Souchoun. The question that remained after the excavation was whether the tea cargo was accurate and the prices and quantities were reasonable. There are no firm conclusion published about that. What we do know is that the main source of income of the Swedish East India Company participants was by illicitly bringing tea into England circumventing the very high customs fees. We also know that the Gotheborg landed in South of England in 1745 on homecoming to take on board a pilot. If that was used to unload some of the cargo is not known in any way. Was a well-known name on a strong cotton cloth, stronger than European cloths and without coloring, other than its natural. The name is European and comes from the name of the area of its production around, Nanking. For their own use the Chinese colored their Nanking cloths with dark blue dye liquor from Indigo plants. The size of one piece was what was needed to make one shirt to a Chinese man. As far as I can tell, this is the original 'jeans' cloth. 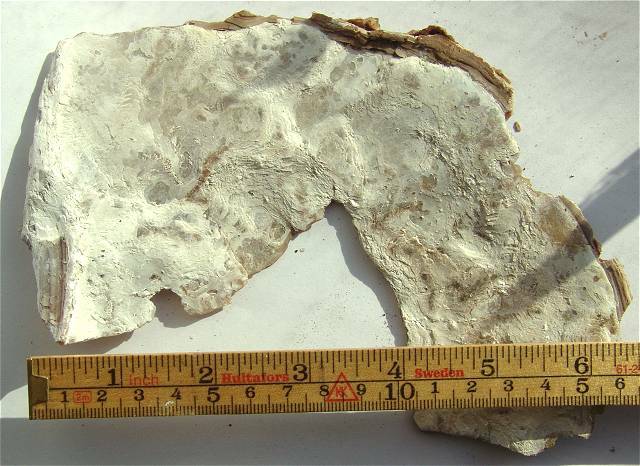 Section of a very large Mother of Pearl shell found mixed in with the porcelain shards brought up by the Keiller salvage operation in 1906-09. Photo: Jan-Erik Nilsson, 2005. Mother of Pearl were brought to Canton from the Pacific Ocean, "on the same ships who brings in the Biche de Mer - a mollusk of unpleasant appearance but appreciated by the Chinese for its 'medically strengthening properties'" advises Liljevalch 1848 (p.206), who also tells the Mother of Pearl shells should be chosen as large as possible. On board the Gotheborg there were 5,609 cattys of Mother of Pearl at Tael 7.5 per Pecul, meaning 3347 kg at a total cost of 420 Teals or equl to 568 Pieces of Eight or 1,893 Dal Smt. From the Bill of Lading we find the information that 289 chests, 12 tubs and 2388 bundles of Chinaware was brought on board. The cost was per 'Particulars' 13190.606 Teals or equal to 17,820 Pieces of Eight or 59,357 Dal Smt. According to Kjellberg 1974, (p 301) Particulars usually meant 'private' as in the Supracargoes. All in all these 19 pieces weights 6.379 kg or in average 335 grams or 0.3 kg each. This is also the normal weight of all standard sized plates being they flat or of the rounded low bowl type. Any number of plates does thus not change the index average but just builds it up towards a stable average. A cup and saucer would need to be three pairs of, to match a plate, and a punch bowl would equal four plates. If we believe that this is not that far from the reality, we can thus estimate that there are in average 3 pieces of porcelain per kg. We can then arrive at an estimate of around 3,000 pieces of porcelain per ton. An early calculation suggests that the porcelain cargo of the Gotheborg was around 100 tons, in which case this means that the cargo consisted of about 300,000 pieces. The index (Nilsson 2005) also gives us a possibility to estimate how much porcelain that has previously been brought up where we only know the number of items. To estimate the total cargo, we will further have the difficult question of anything outside the official bill of lading to consider. During the Keiller and Lyon salvage operation a large number of wooden crates was filled with shards. Some of these shards was later used for making tiles for the floor of the family estate in Särö south of Gothenburg. Some of these crates are still present as they were. Photo: Jan-Erik Nilsson, 2005. After the Keiller and Lyon early 20th century salvage operation, James Keiller Jr. set out to dispose of at least some of his share of the porcelain. To this end a certificate was printed and for one reason or another signed by the British Consul John Duff 'the 18th day of January 1907'. This certificate gives specific information on what was brought up and explains that the permission to salve 'the cargo and hull' of the late East India Company vessel 'Göteborg' was given by the 'Governor of the County of Gothenburg and Bohus'. It also tells that James Keiller, Jr., Esq. amongst other things brought up '1156 non-cracked pieces of real Chinese porcelain during the summer of 1905 and 3205 pieces during the summer of 1906 together with a large quantity of broken porcelain and splinters'. From this we know that Keiller the summer of 1905-06 salvaged 1 156+3 205 = 4361 'unfractured pieces of real Chinese porcelain'. Some of this we know was kept in the family until recently and some was undoubtedly sold. The question is, was anything more brought up at this time? 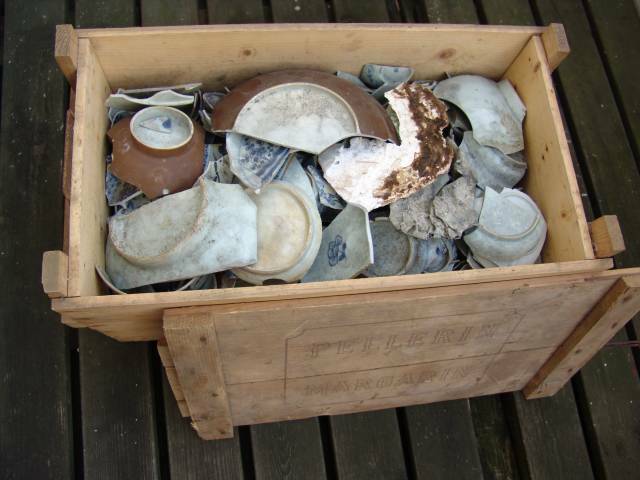 The former Museum Director Stig Roth who in Chinese Porcelain Imported by the Swedish East India Company, Gothenburg 1965, mention the donation of a representative collection by James Keiller to the museum, only mentions the 1905 salvaging. For the validity of this "Nilsson index" it could however be interesting to notice that Roth (Roth 1965 p.15) uses the word 'representative collection' about the donation and that this collection from the illustration in the same book seems to be the usual set of smaller items such as cups, saucers, dishes and plates we have learnt to expect from the Gotheborg, and does not differ much from what was later brought up. The conclusion is that the 4 300 pieces of unbroken porcelain brought up by James Keiller in 1906-09, should thus have weighted around 1.5 ton only. To that comes a number of wooden crates which were filled with shards. If we guess the number of boxes was around 40 and the weight in average was 25 kg, as the one on the picture, we then have explained 1 more ton. 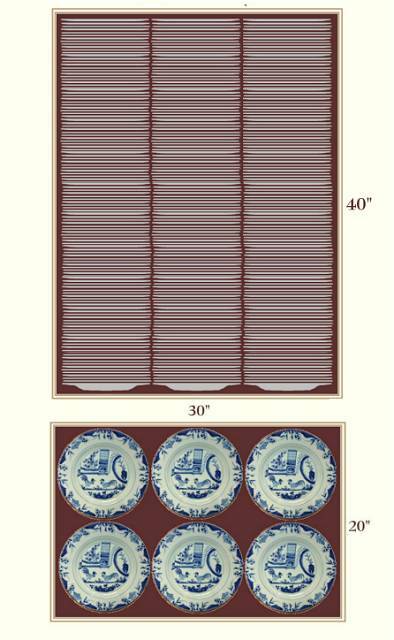 Based on the measurements from Reinius (1745-47) regarding porcelain chests and the measurements from the Gotheborg cargo, this is how one of the porcelain chests could have looked with if filled with 9" (23 cm) flat standard plates. Drawing and reconstruction: Jan-Erik Nilsson, 2005. From documents and diaries there are a lot of information on the different porcelain cargoes of the East India company, but superficial, as if nobody really knows or cares, or the whole subject have somehow got so complicated that no full information is possible to give. However, we will take a look at what the available information if combined with the excavation results can give. From the Bill of Lading we find that the porcelain cargo of the Gotheborg is given in number of parcels but no weight or numbers is assigned to it. From Israel Reinius' diary from his journey 1745-48 we eventually have the measurement of a porcelain crate as 20x30x40 inches. If we compare this with the measurement of a flat Chinese Export standard plate from the Gotheborg cargo, we find that the diameter is 9 inches. Two placed side by side would take up a square surface of 9x18 inches, and six rows of these would take up an area of 18x36 inches, which incidentally would fit exactly in a 20x30x40 inch crate given that the walls are one inch each on all sides. For volume we further notice that one flat plate is 1 inch high and that every further three plates adds one more inch to the pile. After this, it suddenly becomes very easy to figure out all the other the specifications of a porcelain 'chest', filled with flat plates. We also see that the transportation system as expected are well thought out and that the measurements seems to be standardized for best transportation economy. To continue the calculation we start with the outside length measurement of 40, deducts 2 inches for the walls and ends up with an inside length of 38 inches. Given that the first plate takes up 1 inch and that we can fit in 111 flat plates on the remaining 37 inches we arrive at a full row of 112 plates. Six rows like this in a box gives us 672 plates per crate. I have most carefully weighted a number of plates from the Gotheborg and they are exactly 3 per kg. Total weight for the crate disregarding the tara (the box in itself) thus becomes 224 kg. To try to widen the base for the cargo estimate I decided to do the same calculation for a couple of other standard shapes of this cargo. First the medium sized fruit dishes with flattened rim that seems to be so common in this cargo and so rarely seen outside of it. The diameter is typically 6.5 inches (16.5 cm). The first dish in a pile builds slightly more than a flat plate - 1.25 inches (0.32 cm) - but they add the same number per inch i.e. three. To fit this best possible in a 20x30x40 crate we would first make one bottom layer with four rows 37 inches long and 6.5 inches in diameter. This would give us a nice bottom layer with 112 dishes in four rows from wall to wall. Next we could continue with three rows and then finish of with a top layer of four more rows. All in all this would give us 11 rows of 112 dishes each, or a total of 1,232 dishes into each crate of this size, with plenty of space for rice straw for padding. As for weight each of these dishes weights 200 grams, which equals 5 in a kg and thus gives us a total weight for one of these crates at 246 kg. Regarding profitability we can notice that we can have twice the number of these dishes at the same space and weight as a normal plate. I call these slop bowls because I have no other name for them. In China they would have been pretty ok soup bowls but in a Western context it is a little more difficult since the rococo ladies and gentlemen did not eat soup in bowls like that. They did however have tea and before the invention of tea bags they needed somewhere to dispose of the used tea leafs. At least this will be the theory until further. Transposing ceramic vessel shapes across cultures is never easy and I can feel a twang of sympathy for the fashionable ladies sitting there fiddling with their brand new tea set and trying to look like they know what they are doing finding a use for a medium sized bowl. However leaving it at that regarding the use of these strangely sympathetic bowls we will look into how they would pack in a porcelain crate. With a diameter of 6 inches (15.5 cm) they are slightly smaller than the fruit dishes. At 6+6+6 = 18 and 6+6+6+6 = 24 they would pack well inside a 20x40 framework and have plenty of space for three layers of four rows each. Due to the rounded (bowl) shape the do not pack as compact as flat dishes though. The first bowl would take up its full height in space and every three more would take up slightly more than 1.5 inches. Since the walls of the bowls would not be close enough to support each other the packing of these would be more complicated than with flat wares and I can think that these are one of the wares that might go better in bundles. However, to look into the space/weight ratio we can still calculate that with some proper padding we would be able to fit at least two per inch in a row which would give us 71 bowls per row in 12 rows per crate i.e. 852 bowls in a crate. The weight of an average bowl of this type is c 300 grams, which gives us a total weight of the crate also of around 250 kg, or exactly 255.6 kg. To at this stage arrive at a 'quick and dirty' estimate about the porcelain cargo of the Gotheborg we take the information from the Bill of Lading, that the cargo was of 289 chests, 12 tubs and 2388 bundles of Chinaware and roughly guess that give and take some here and there the cargo would average the number and weight of 300 chests, one third each of plates, dishes and bowls. The average weight would in that case be 224+246+256/3 = 242 kg. We would then arrive at an estimate of 300 x 242 kg = 72,6 ton plus 2388 bundles of maybe 10 kg each = 23.8 ton. Almost exactly 100 ton and, according to the Nilsson index, around 300,000 pieces of porcelain where a teacup and saucer is counted as one (pair). By using these measurement we can also just for fun figure out the 'displacement' of a porcelain chest, which is its floating capability in shipping terms, which is roughly 99*74*50 cm = 366,300 cm3 / 1000 = 366.3 dm3 which is the surprising figure of 360 kg, or in pounds, around 750 lbs. Instead of as one might assume that a porcelain chest would sink immediately like a "rock" it actually floats as long as it is watertight. From this we can thus assume that those who started out to salvage their cargo immediately after the foundering should have had a reasonable easy job while those who waited a few days until when the crates had become water filled, would have stood before a well neigh impossible task. Something which is also confirmed by contemporary account where it was clear that almost all the cargo that had been salvaged at once was that which belonged to the officials and crew onboard. To help with calculations, here is a conversion table of the different currencies used in 1743. The SOIC books was until 1776 kept in Swedish Daler Silvermynt, here shortened to Dal Smt. 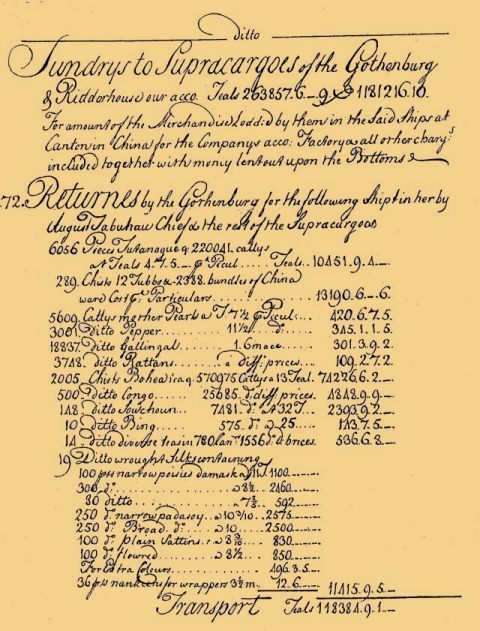 Due to a value depreciation in Sweden in 1745 the exchange rate was changed in Sweden at the 'time of sale' (1745 or later) as compared to 'time of buying in' (1744), why we need to consider this when calculating the profit from the sales of the cargo. While settling the actual costs of the cargo, we will use the following conversion table made by me here and based on information in Kjellberg 1974 (p.295).